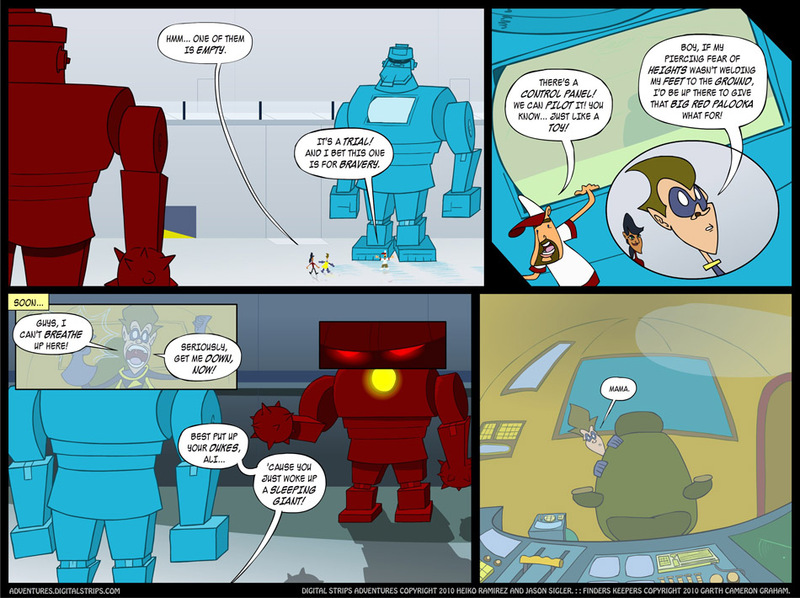 Digital Strips Adventures » Archive » Episode 5, Page 10: Let’s Get Ready To RUMMMMBLLLLLLLE! I’ve said it before and I’ll say it until this arc ends: the idea of changing the location on a whim is something I want to make into a comic. Sure, DSA is good for that on a longer-term basis, but changing from strip to strip, update to update? That’s something I could quickly get behind. And hey! As proof, here’s a secret lab that houses two giant, strangely familiar robots. I’m not going to spoil the next page, but the title should tell you where things are going. Stay tuned for the Thrilla! Oh, and I’ll see what I can post this week about a possible new look for the DSA cast. Really excited for this, so check that out sometime around mid-week!